GESAB solutions for control centers were chosen by the United Nations to equip its logistics base in Quart de Poblet, Valencia. United Nations had the need to enable 14 operator desks, with a control console, ergonomic chairs and supports for monitors, in short, a set of specific elements for 24x7x365 operations centers. GESAB prescribed the ADVANTIS control console, along with Freedom chairs and supports for monitors by Humanscale. The versatility of the ADVANTIS solution was the key to meet the UN needs to have very different positions in its configuration. As a complement, the versatile GESAB bucks that accompany its range of control consoles were added, allowing the storage of documentation, without interfering with the ergonomics, safety and efficacy of the work station. 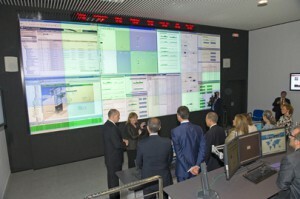 The UN Communications Center was inaugurated in July 2011 by the Secretary General of the United Nations, Ban Ki-moon. The facility, located on the grounds of the former military airbase in the south of the airport of Manises, aim to ensure communication of the international missions of the United Nations. It has double the capacity of the installed base in the Italian city of Brindisi that performs the same functions and can reduce the risks associated with dependence on a single center, as explained by Secretary General Ban Ki-moon in January 2009 when signed by the then Deputy Prime Minister Maria Teresa Fernandez de la Vega, the agreement to establish the base, the first United Nations in Spain and second in Europe. The new center informs the United Nations with more than 100,000 people working in peacekeeping operations worldwide.